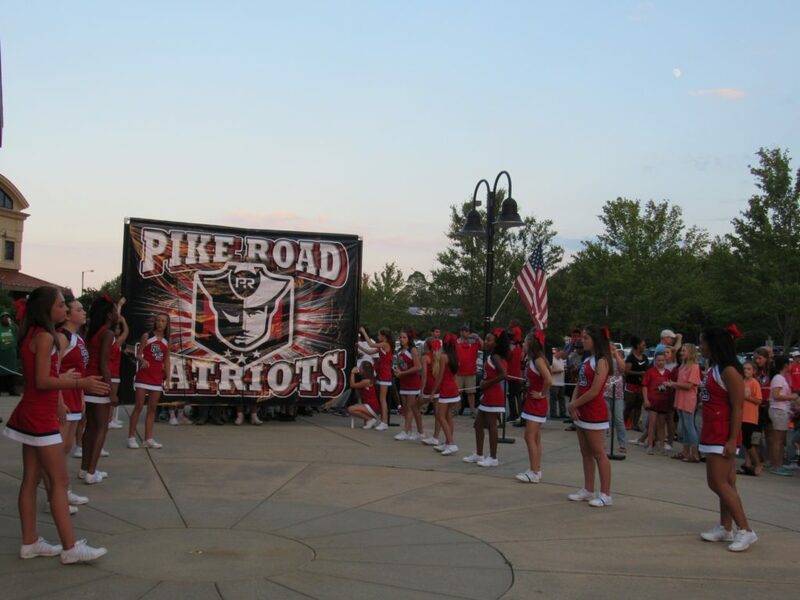 PIKE ROAD, Ala: The Town of Pike Road and Pike Road Schools (PRS) hosted a community pep rally and parade to celebrate the PRS Patriots’ first varsity Homecoming. The events featured cheerleaders, football players, the Pike Road High School band, show choir, and a vibrant illustration of the community’s support of the growing school system. Community engagement in the schools is a huge contributor to their success. In just a few years, PRS now serves students through 11th grade with three campuses and a dynamic array of student programs for all ages, including a pep squad, Future Farmers of America chapter, and robotics teams. On Thursday, Sept. 20, the parking lot of the Pike Road Town Hall was filled with students, parents, friends and neighbors. After introducing the PRS varsity football team, head coach Patrick Browning thanked the Patriot fans for their support at every event leading up to this moment. He then presented PRS Superintendent Dr. Chuck Ledbetter with a team ball to commemorate the first varsity Homecoming game, held Friday, Sept. 21. The show choir made their debut performance, showing off their talent and energy with a crowd-pleasing dance. Then, the cheerleaders and Patriot Band went to work, preparing everyone for what was to come: the introduction of the new pep squad, who welcomed Victor E Patriot, the PRS mascot. Mayor Stone then took the stage, led a rousing “Pike Road” chant, and introduced the Homecoming court. Together, homecoming hopefuls raised over $13,000 for charities. The Mayor expressed gratitude for Ms. Georgia Washington and all she did to pave the way for everyone to receive a quality education and presented a new tradition paying tribute to her legacy – a bell that would take center stage at every Patriot game and spirit event. The bell connects today’s students with Ms. Washington’s: She would ring a bell to call them into class, and that bell, refurbished by past students, is on display in the Georgia Washington campus. The pep rally wrapped up with the Alma Mater, another connection to the area’s history. Patriot Band Director Patrick Darby transcribed the song from a rendition by original Pike Road School alumnus George Howell, who sang it at the Oct. 25, 2017 dedication of the newly refurbished and reopened Pike Road Historic School. Now, it is played after every football game and spirit event! The excitement continued Friday, Sept. 21, with a parade in the historic Mt. Meigs area. Patriot fans lined the streets around the Georgia Washington campus, and students, community leaders, and more poured out of the Antioch Missionary Baptist Church parking lot in parade formation. Led by the Montgomery County Sheriff’s Office, and followed by the Pike Road Fire Department, it was an exciting celebration of community partnerships. Members of the Homecoming court rode atop cars in true parade fashion, and when the vintage car one young lady was riding overheated, spectators jumped into action. Mayor Stone and other gentlemen from the crowd helped push the car through the rest of the parade. We have not yet identified all the helpers, but we extend our thankfulness for their selfless contributions. Each grade of students rode on floats representing decades like the “Electric 80’s” and “Sock Hopping 50’s & 60’s,” the wrestling team showed their “Patriot Mania,” and agricultural science students rode behind a big green tractor, showing off their Hornet Spray. The Patriot Band made their marching debut, adding another milestone to the event. Friday evening, supporters took to the stands and the Patriots took to the field for the main event: PRS’ first varsity Homecoming game. Held at ASU’s Hornet Stadium, the Pike Road Patriots fought hard for a victory against the Bullock County Hornets, encouraged by an audience that nearly filled the ASU stands. With the Patriots down 7-14 at halftime, the Hornet band and Honeybees marched, played and danced before welcoming the Patriot Band to the field. The band stood in formation as a backdrop to the recognition of the Homecoming court and the crowning of the Queen: Kennedy Jones, 11th grade, who raised money for the Montgomery Area Food Bank during her Homecoming journey. The Patriots played hard in the second half, pulling through with a 31-28 win, and the audience honored the occasion with the Alma Mater, led by the Patriot Band. It was an incredible way to end a week of celebrations marking an important milestone for PRS and the Town of Pike Road community. Thank you to everyone who joined us for these events! For more information or to schedule an interview, contact Turner Waddell by calling (864) 958-6577 or emailing Turner@pikeroad.us, or contact Rebecca Williams at Rebecca.williams@pikeroadschools.org or (334) 782-5334.